Stamp duty in England may be changed to encourage people to make their homes more energy efficient. Energy minister Claire Perry told the BBC householders would face “carrots and sticks” to prompt them into saving on heating bills and carbon emissions. It may form part of a plan by ministers to get about a million homes a year renovated during the next two decades. The government will fail to meet its climate change laws unless it can cut emissions from household heating. The proposals are part of the government’s long-delayed Clean Growth Plan, being published on Thursday, which defines how it aims to reduce carbon emissions across the whole economy. As part of the the Climate Change Act, the government needs to cut CO2 emissions by 57% from 1990 levels by 2050. A recent report called for radical policies to incentivise homeowners – such as fining people who sell cold, draughty homes, or introducing a variable stamp duty to reward those who have insulated their homes and punish those who have not. The point of sale of a house is seen as the best time to undertake improvements that many people find costly and disruptive. Ms Perry told the BBC Radio 4’s Today programme she was “interested” in the idea of lowering stamp duty on properties that have been made energy efficient. She described the idea as potentially “one of the incentives” to encourage homeowners into implementing energy-saving measures on their houses. The application of stamp duty is devolved around the UK, so this would only apply to energy efficient homes in England. Homes now account for 13% of the UK’s emissions, and this rises to 22% once electricity use is taken into account. Ed Matthew, from the climate change think tank E3G, has welcomed the plan but says there needs to be a clear strategy. 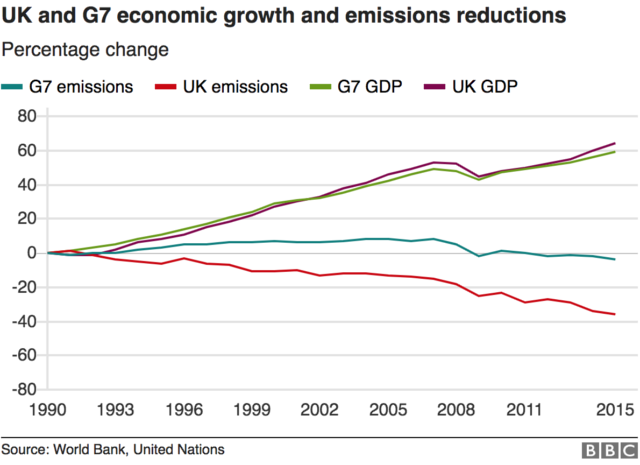 The UK has led the developed world by boosting its economy 60% whilst cutting carbon emissions 42% since 1990. But most of the carbon saving has come through cutting down on burning coal for power. Advisors warn that the government’s future policies will lead them to miss carbon targets by a long distance. They say emissions from transport and housing have recently been going up. Ms Perry said the plan would cover all parts of the economy, including cars and industrial emissions. But energy campaigners fear the plan will not contain the measures necessary to meet the government’s own laws on cutting carbon. Jonathan Church, a spokesman for the environmental lawyers ClientEarth, said the strategy didn’t go far enough. Written by Roger Harrabin, BBC environment analyst for his article on www.bbc.co.uk, click here to be redirected to the original article.